Patterns, the latest game from Second Life creators, Linden Lab, is a sandbox-style game that focuses on building structures and exploring in an open world environment. While there is no specific plot, goal, or antagonist (other than physics) to speak of, Patterns does trigger a desire to explore. Almost the entire landscape can be altered by digging up various materials — all of which are infused with realistic properties such as weight and density, which lends a unique realism. 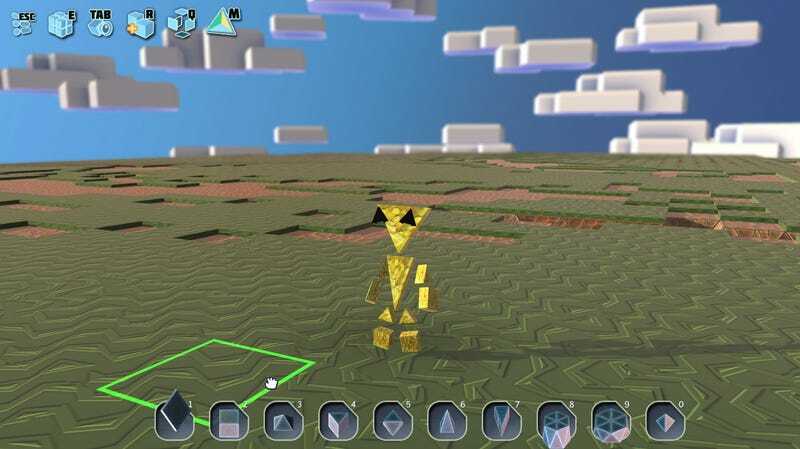 Players move the about the game via a basic polygonal avatar that has the ability to dig and build structures out of various shapes made up of the materials. Each one has its own unique properties that react in different ways, depending on how they are used. For example: using shapes made up of foliage can barely withstand the weight of your character while structures built with stone can. On the other hand, some materials are so heavy that they are prone to collapsing in on themselves when stacked too high. Once you get the hang of it, it's fun to experiment and see how far you can push the boundaries of physics. Click through the gallery above to see a few shots of my first experience with Patterns. Above: Here we have the star of Patterns. There might not be much to him, but as characters like Rayman have taught us, elbow and knee joints are way overrated. He's nicely animated and easily controlled, though he's prone to shattering when dropped from too great a height. Kris Horton is a digital artist and car designer based in Southern California whose work has been published, televised, and sold in-store all over the world. Each of the many materials and elements found throughout Patterns holds unique properties. The rare element of Starene has explosive properties and can be built into bombs. Other elements affect the character's movement such as ice, which is (you guessed it) slippery, and quicksand, which slows your character down as he slowly sinks. This is the game's shape editor with which you can construct objects using the basic square and triangle shapes in the game. Cubes are easy to work with, but constructing pyramids, prisms, and diamonds will help you create more advanced structures in the game. Collecting the Starene shapes found hidden throughout the maps will also give you access to new shapes. So here is how I started out. It wasn't much to look at, but it was nice and flat, which would help me get the hang of building something without it getting too lopsided. As you collect materials throughout the game, the terrain changes and starts to look a bit like a rock quarry. You dig for a while, and eventually you hit the hard stone beneath the soil. I began building by putting down a bit of a foundation. I had to take into consideration the fact that anything that is built in Patterns needs to be supported in a fairly realistic manner or it'll topple and you'll have to start over. Here's a great example of what not to do. This is what you're greeted with when you don't plan properly and get a bit too ambitious with your object stacking. Structural weaknesses are called out by a (for lack of a better term) sparkle, which, as you continue to ignore it (as I so often did) gets more noticeable until the structure just crumbles. After getting the hang of constructing things and learning some limits, I finally created something that is vaguely building-like. The exploration aspect of Patterns is quite fun, but I really enjoyed building objects — it reminded me of playing with building blocks as a kid, or the first time I built a 3D model on my computer. Before I knew it, I was learning the fundamentals of architectural design. To see what you can make using Patterns, get it today. The updated genesis release — with new substances you can destroy, build with, bounce, and slide on; new formations you can create to blow things up or cover surfaces with ice; new planets to explore; and more — is now available at a 50% discount.